While we can’t confirm that pickle juice will keep you young, the brine is definitely worth keeping around in the kitchen. Here, four ways to use it. In this week’s Chefs in Conversation video, Andrew Zimmern and Gail Simmons chatted about Jewish food traditions, including drinking shots of kosher pickle juice to help ensure a long life. 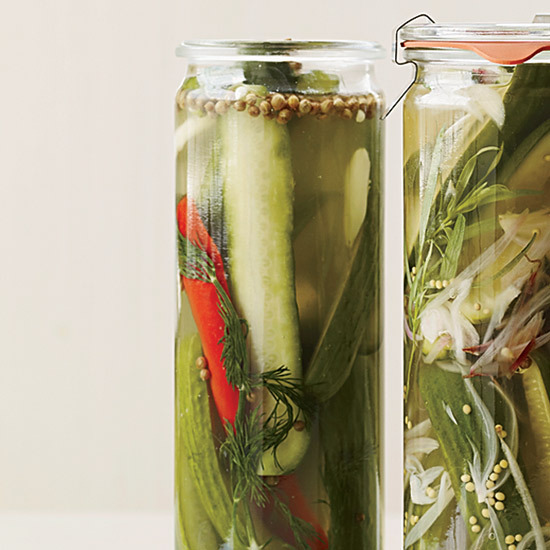 While we can’t confirm that pickle juice will keep you young, the brine is definitely worth keeping around in the kitchen. Here, four ways to use it. Bake it into bread. Baker Peter Endriss makes his incredible rye bread with a wild yeast starter, which gives the bread a wonderfully tangy flavor. But home cooks who can’t get a hold of wild yeast can add pickle or cornichon juice to the dough for similar complexity. Brine chicken in it. Brining chicken overnight in pickle juice gives it both incredible flavor and ensures that it stays ultra-juicy. The technique works for both roasted and fried chicken. Slather it on brisket. Before barbecuing his brisket for 10 hours on the grill, Paul Kirk slathers the meat with a mix of hot sauce, Worcestershire, dark brown sugar, Dijon mustard and pickle juice. Add it to a Bloody Mary. A touch of tangy pickle juice takes bloody Mary mix up a notch. People won’t be able to put their finger on the flavor, but they’ll love it.